Rose Coschignano/Pipe Dream Photographer Connector Road, which passes between College-in-the-Woods and the Nature Preserve, is designated as a reduced salt area in an effort to protect yellow-spotted salamanders from road salt’s harmful effects. Every February and March, yellow-spotted salamanders migrate from College-in-the-Woods to the Nature Preserve. But with the amount of snow that has accumulated at Binghamton University this winter, the salamanders may face a more difficult challenge while migrating this year — salt. Salt, which is used to melt snow and ice on pavement, is toxic to the salamanders, who have to cross Connector Road to complete their annual migration and lay eggs in Harpur Pond. According to Michael Armstrong, an instructor of biology, the salamanders are particularly susceptible to the effects of salt because of the way they breathe. Jessica Hua, an assistant professor of biology, said salt can have varying consequences for amphibians. The University has tried taking the salamanders into consideration when making decisions about which roads to keep open during the winter and by regulating how much road salt they use on campus. Until the 2017-18 academic year, Connector Road was closed to traffic during the winter. 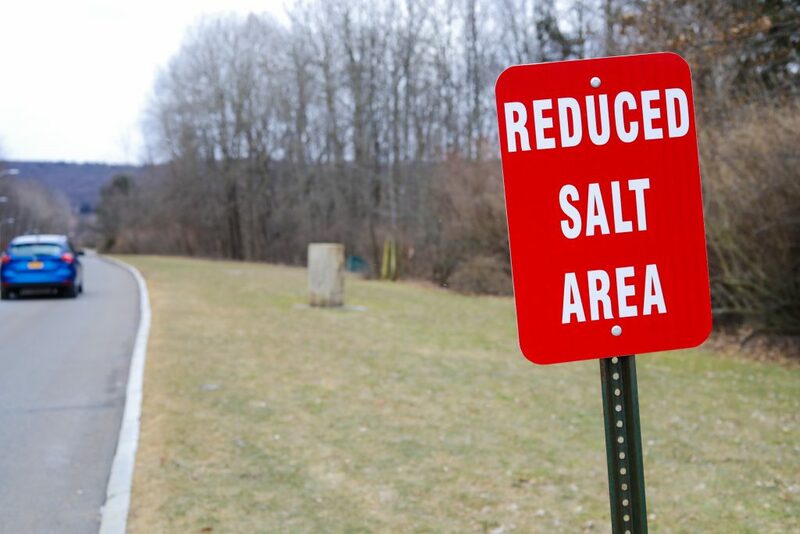 But since then, the University has kept the road open throughout most of the year, closing it during March to allow the annual migration and designating it as a reduced salt area, which limits the amount of salt used on the road before, during and after winter storms. According to Miranda Kearney, visiting assistant professor of biology, the salamanders continue to cross the road because they are used to their migratory patterns. The salt on Connector Road may not be the only danger for the salamanders. Devin DiGiacopo, a fourth-year graduate student studying biology, said road salts can also spread through water and move from locations around the Nature Preserve into Harpur Pond. According to DiGiacopo, road salts in the water can have an effect on salamanders’ larvae. Dylan Horvath, steward of BU’s natural areas, said the only ways to prevent salt from affecting salamanders would be to stop using salt on campus entirely or to use alternative options. “It hasn’t been possible, yet, so the compromise is to hopefully lower the impact of salt on the salamanders,” Horvath said. Horvath added that it’s important for the University to consider the environment when making decisions about surrounding roads and facilities.